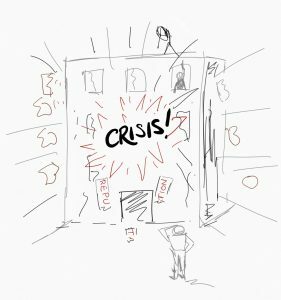 You are here: Home / Uncategorized / Three critical CEO tasks in a crisis. I’m in the UK at the moment and one of the banks has just had an IT issue that means customers are unable to access their money. For days. It’s a classic case of an update going wrong live when it was OK during testing. This kind of thing has happened before and it could happen again – to you. The issue for the CEO is not technical or simple. This kind of setback destroys more than profit, it is a bomb in the heart of the organisation’s reputation. So the big CEO task is to defuse that reputation bomb while making sure the organisation fixes the operational issue. But there’s a dilemma. Even great CEOs are just people and it’s tough to find the balance between acting as your personality dictates and acting as your role dictates. Are you ‘the CEO’ or ‘yourself’? There are many conflicting answers to this question and no single easy answer. Advice comes from all directions depending on who’s affected and how they perceive the CEO’s role. You have to choose, which calls for strong basic principles upon which to choose and clarity about what your role requires of you. What is the vision and how does this issue highlight it? When you are able to answer this question, you have the opportunity to make the core vision come to life – even if your immediate challenge makes it look hopelessly unreal. In the case of the British bank, a vision for superb customer experience looks ironic when the customer experience is terrible. Yet by doing a good job of fixing the problem, the CEO can bring the vision alive even under tough circumstances. We are yet to see how this will play out in this case, but working the vision to inform action is a CEO task that could inspire the organisation and the customers. Pull the whole organisation together. Big setbacks also test trust, responsibility, culture, values and organisational cohesion. The executive team feels this most keenly. Now is the time for mutual support rather than recrimination, for innovation rather than reflex. It’s not just the CEO who has to be ‘on message’. Each executive needs to be just as clear at expressing internally and externally what is important and how the organisation is living its vision and values. The CEO task is to draw the team together to produce a cohesive, powerful, systemic response. Setbacks test our belief in how good we are. Even the best get thumped by unforeseen events. The task of the CEO, the top team and anyone who wants to be a leader is to reassert the standards, remind everyone how good they still are but to press forwards to higher standards. Some setbacks are ideal, unique opportunities to learn distinct competitive advantage for the future. The ideas above arise from three of the twelve essential CEO tasks that define CEO effectiveness. By reflecting on how a tough issue affects them, you can quickly identify how best to respond to a setback, and craft a rich set of strategic options even before you work them through with your team or external specialists. It’s during setbacks that the CEO can feel most lonely, yet by being clear about your role you can focus on the priority task, delegate crisply and improve reputation in the very heat of an attack. That’s when your executive action transcends ‘leadership’. « Learn and lead through dance.